I had a mentor in the wealth building from the beginning, a real guide who had successfully built a real estate empire. He’s been an extremely private individual in the wealth space, and he’s honestly the smartest person I know. Since the founding of Future Money Trends in 2010, I’ve asked him nicely to commit to writing a letter a week for us. To my disappointment, he’s always said no thanks. That is all until now. Like Ray Dalio, he’s committed to spending the last part of his life teaching, giving, and sharing what he’s learned with others. For years, other major publishers have tried to recruit him as a “guru,” and he’s declined them all. Luckily for us, he knows me personally and is a dear friend. Please read the first letter he’s agreed to let us share with you. Most Certainly be Poor by the End of It! Prior to World War I, it took 4.2 German marks to purchase one U.S. dollar. Post-war, it took 3.9 trillion marks to buy a single U.S. dollar. In the 1990s, Zimbabwe’s dollar was 1-to-1 with the U.S. By 2009, it was 100-trillion-to-1, and by 2015, it was completely worthless. Venezuela was 4-to-1 on the exchange of bolivars to dollars not too long ago. Today, it’s essentially a dead currency. All of this happens slowly and then changes in an instant. Do you remember way back in 2000 when our national debt was $5 trillion, then doubled to $10 trillion in 2008, only to double again by 2017 to $20 trillion? 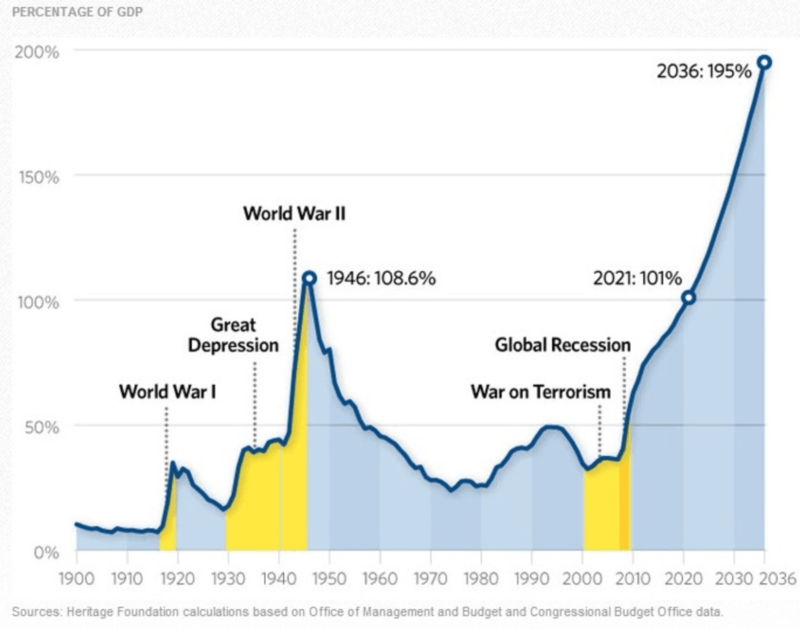 Since 2001, the national debt has gone parabolic, and there is zero chance it will reverse course. In the short-term, the economy benefits from deficit spending. Borrowed prosperity drives economic growth, putting voters in a good mood, and it helpsconsumers purchase what they can’t afford. What does this all mean for us as investors, parents, residents of North America, anyone with ties to the U.S. economy (basically everyone reading this)? 1. It is a certainty that the Social Security Trust Fund won’t have enough money to cover the retirement of the baby boomers. 2. The debt will only grow until it can’t anymore, and then what? 3. Much of what we perceive as normal is actually an illusion of prosperity. Not everyone went broke when Germany suffered through hyperinflation.The same is true for Zimbabwe, and even Venezuela. In fact, some of the largest fortunes were amassed during both the German hyperinflation and the U.S. Great Depression. The people who see the writing on the wall and are asking themselves the right questions are going to make a bloody fortune over the next 3 to 5 years. I’ll address the 3 certainties above in my next letter. This work is based on SEC filings, current events, interviews, corporate press releases and what we’ve learned as financial journalists. It may contain errors and you shouldn’t make any investment decision based solely on what you read here. It’s your money and your responsibility. We have been compensated three hundred thousand dollars for a ninty-day marketing campaign, directly by sandspring resources. We also plan to purchase shares in the future as well as participate in any potential private placements that may be offered. Never base any decision off of our emails. Never base any decision off of our emails. The information herein is not intended to be personal legal or investment advice and may not be appropriate or applicable for all readers. If personal advice is needed, the services of a qualified legal, investment or tax professional should be sought.